Umbilical cord (UC) has been suggested as a new source of mesenchymal stem cells (MSCs). In this report, we isolated MSCs from the fetal UC of goat and investigated their multipotency of differentiation into germ cells in vitro, in the presence of 0–20 % bovine follicular fluid (FF). The phenotypes, capacity of proliferation and expression of MSC markers were served as the indexes of multipotency of the isolated UC-MSCs, those were ascertained by growth curves, RT-PCR and immunofluorescent staining, respectively. Our results showed that the UC-MSCs shared a similar immunophenotype to those cells reported in mouse and human bone marrow MSCs, as well as some characteristics seen in embryonic stem cells (ESCs). In addition, our data also demonstrated that a dose-dependent function of FF on the states of differentiation of goat UC-MSCs. From 2 to 20 % of the FF can promote the proliferation of goat UC-MSC, especially the 5 % concentration of follicular fluid promote proliferation was significantly higher than 2 %. 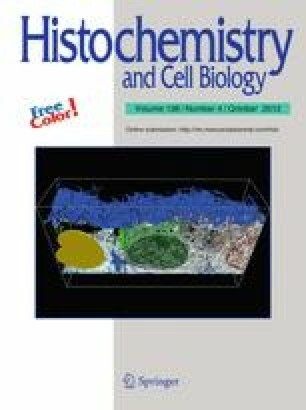 In contrast, higher concentration of follicular fluid (>10 %) induced goat UC-MSCs differentiation into oocyte-like cells. These findings provide an efficient model to study the mechanism on cell proliferation and germ cell differentiation in livestock using FF. The online version of this article (doi: 10.1007/s00418-012-0975-7) contains supplementary material, which is available to authorized users. The authors sincerely thank for Dr. Xiaoming Liu to revise our manuscript. We appreciate the editor and reviewer’s excellent work and suggestions. This work was supported by grants from the Program (30972097) from National Natural Science Foundation of China, Key Program of State Education Ministry (109148), Program for New Century Excellent Talents in University (NCET-09-0654), Program of Shannxi Province (2011K02-06), The Fundamental Research Funds for the Central Universities (QN2011012), China Postdoctoral Science Foundation funded project (200801438).